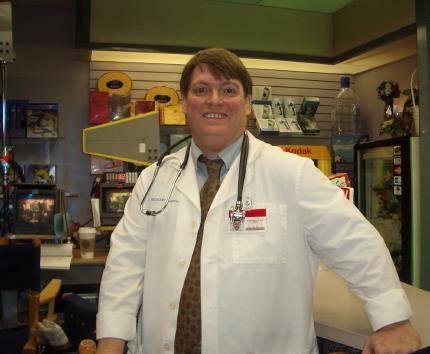 On Monday, February 9, 2004, I began my one-day career as a television star with a special guest appearance on the hit NBC television series 'Scrubs'. During the twenty minute drive from my hotel to the studio on Riverside Drive, I memorized all my lines and mentally prepared for a full day on the set. The producer had called me over the weekend and told me I had an eight o'clock call, so I was ready for a full fourteen hour day. If you haven't seen any season three episodes yet, you may want to read the original version of this story instead of continuing ahead. In December, shortly after I had won the role, a production intern called to review the details and schedule my visit. I needed to be available for two consecutive days and she suggested that the weeks of January 12th or February 9th would be best. February worked better for us, though the January date might have been interesting - I think Michael J. Fox was shooting his episodes that week, though at the time I didn't even know he was going to appear on the show. 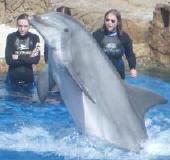 I made the travel arrangements and finalized our vacation plans for what would be a whirlwind week. We'd been to Disneyland before, so we gave this trip a Hollywood focus. We made arrangements to tour the Los Angeles area by helicopter, see a traditional sitcom being filmed ('Still Standing'), walk around Hollywood and the Walk of Fame, visit Paramount Studios and the set of 'Star Trek: Enterprise', swim with the dolphins at "Sea World", and window shop on Rodeo Drive in Beverly Hills. 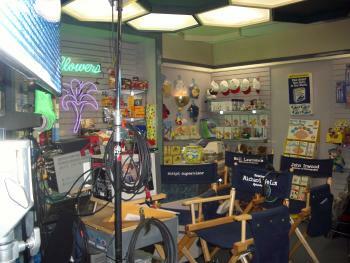 And, though all of those things were very cool, the 'Scrubs' walk-on role and set visit was the highlight of the trip. On the Tuesday before our flight out to L.A., associate producer Danny Rose called to confirm the arrangements. He indicated that although the script wasn't yet finished, Monday the 9th looked good. Two days later, I came home to a message on the answering machine that confirmed it. 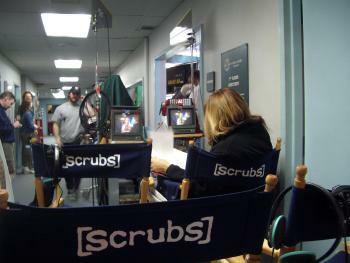 "Hey, it's Danny at Scrubs - Monday is the most perfect day I've ever seen an interior walk-on ever do. It is all perfect scenes. Every single scene will have background, so I'm really glad this is working out great for Monday." 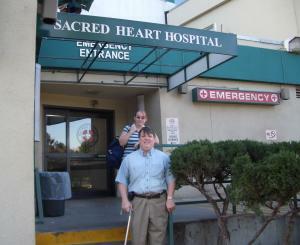 I called him back, we finalized the details and traded cell phone numbers in case there were any last minute changes, but it was now official - the admissions work for our once in a lifetime visit to Sacred Heart Hospital was complete. 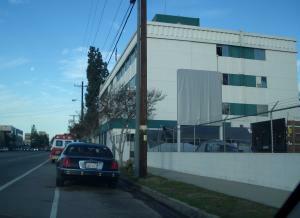 During filming for the first season, there were occasions where people drove in, thinking it was still a working medical facility. That seems less likely to happen today. Closed to the public since 1998, any signs on the unassuming building which may have indicated it was a hospital have long since been covered up or removed. Most viewers wouldn't recognize the building from the street - the stock exterior shots for 'Scrubs' were filmed outside another hospital elsewhere in Los Angeles. It's easy to miss if you're not looking for it, though I'm sure some are confused whenever the Sacred Heart ambulance is parked out on the street, as it was when we first arrived. Once inside, we proceeded down the hall and a guard directed us to a back elevator, which took us to the third floor production offices. Danny had told me who to look for, but not where to find them. A very friendly assistant directed us back down to the first floor and in past an area dressed as Sacred Heart Information Services. There was a large open area with a few sofas and chairs with clothes racks all around. A few dozen extras in various hospital garb were sitting, chatting, reading or watching a small TV. I was introduced to Oorala Yamada, the production assistant in charge of the background actors and one of my contacts for the day. We went into her office to go review details of the walk-on role. She asked me if I wanted to be a doctor. I'm not sure what the other options were, but being a doctor was my first choice anyway. 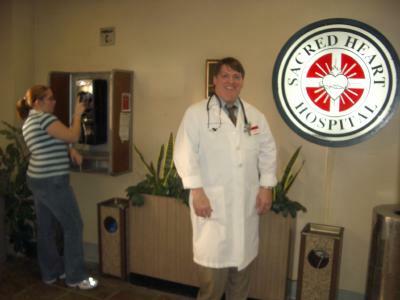 I didn't have my reading glasses so I don't know what the fine print said, but I signed the release and became the latest addition to the fictional medical staff of Sacred Heart hospital. We spent much of the morning in Video Village talking with Richard, John, and various crew members. 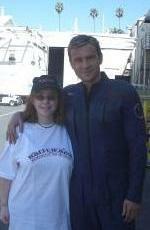 I would have loved to talk with series creator Bill Lawrence, but he was not on set that day.